Stanley Yelnats has been sent to a juvenile detention center for a crime he didn’t commit. It’s just one more incident of the bad luck that has plagued Stanley’s family since his great-great-grandfather left Latvia. At the ironically named Camp Green Lake Stanley learns to endure the forced labor of digging holes in the sand each day and he also begins to solve the mystery of the Warden and her camp. If only Stanley’s discoveries were enough to break the family curse. The humor in Louis Sachar’s books always tickles my funny bone. My family still quotes Sideways Stories from Wayside School regularly, even though my kids are teenagers now. 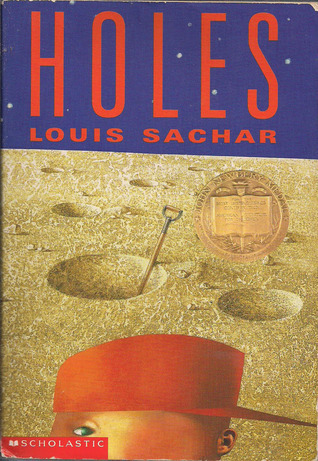 It took some time for me to get around to reading Holes. I’m so glad I did. Sachar’s story is amusing and outrageous, like the Wayside School stories, but also there’s a good bit of truth in it, truth about loyalty, about hard work, about making the right choices. Thanks to my friend Sarah Endo for suggesting I read it and lending me her copy!